Taiwan Beefs Up to Take On the U.S.
TAIPEI, Mar 18 2012 (IPS) - Taiwan civic activists and opposition parties have launched efforts to block plans by the Chinese Nationalist Party (Kuomintang or KMT) government to “conditionally deregulate” the import of United States-produced beef containing residues of ractopamine, a controversial “growth enhancing” chemical used in cattle feed. 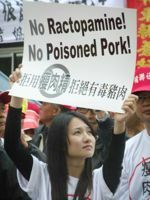 A Taiwanese woman protests outside the national legislature against a decision to ‘conditionally deregulate’ import of ractopamine-laced U.S. beef. Credit: Dennis Engbarth/IPS. Just after winning re-election Jan. 14 by a 51.5 percent to 45.6 percent margin over opposition Democratic Progressive Party chairwoman Tsai Ing-wen, President and KMT Chairman Ma Ying-jeou told visiting American Institute for Taiwan (AIT) Chairman Raymond Burghardt Feb. 1 that his government could re- open talks with Washington to ease restrictions on the import of U.S. beef and beef products. Taiwan currently bans domestic use of ractopamine and most other “leanness enhancing” drugs in livestock production, and the import of meat products that are found to contain any residues or traces of ractopamine. Taiwan would seem to be a minor market for U.S. beef. Only 3.7 percent of the 5.42 billion dollars worth of beef and “variety” products (such as brain, eyes, intestines and spinal cords often called ‘offals’) exported annually by the U.S. is destined for Taiwan, according to U.S. Department of Agriculture (USDA) data. Nevertheless, Washington has put intense pressure on Taipei to fully deregulate controls on imported beef and pork products. After failing to secure major concessions from the previous DPP government, Washington secured a signing of a secret protocol with the Ma government in October 2009 that lifted restrictions on imports of U.S. beef-in-bone, ground beef and assorted ‘offals’, thus overturning a ban imposed by the DPP administration after the detection of bovine spongiform encephalopathy (BSE or mad cow disease) in the U.S. in December 2003. Ultimately, civic protests and a legislative revolt forced the KMT government to accept revisions in the food health regulatory act that partially re-imposed restrictions on ground beef, brains, eyes, spinal cords and intestines and led to the resignation of Ma’s national security advisor. Similarly, in the wake of vocal civic opposition to Ma’s commitment to Burkhardt, more than half of the 113-seat national legislature, including over 30 of 64 KMT lawmakers, co-sponsored or supported draft revisions to the Food Health Regulation Act that would effectively continue the ban by imposing a ‘zero indication’ testing standard. Nevertheless, Economic Affairs Minister Shih Yen-hsiang told lawmakers Mar. 8 that that Washington considered Taipei’s position a “litmus test for whether Taiwan is a reliable trading partner.” Pro-KMT economists publicly warned that the deadlock was causing the suspension of bilateral trade and investment talks and could block plans to allow visa-entry into the U.S. for Taiwan citizens. After three seminars with government officials and health experts failed to reach a consensus, the KMT cabinet issued a news release late on Mar. 5 announcing its plan for “conditional deregulation”. National Taiwan University (NTU) School of Veterinary Medicine dean Chou Chin-cheng, a member of the technical advisory commission, told IPS that there simply has not been any credible research on the direct impact of ractopamine residues in beef or pork on human consumers, and stressed that the growth enhancing drug may pose risks to certain consumers, including infants or persons with high blood pressure or diabetes. Chou also observed that the Codex Alimentarius Commission set up by the Food and Agriculture Organisation and the World Health Organisation to set food safety standards has failed to agree on safe maximum residue levels for ractopamine. “The entry of ractoprine-laced beef into Taiwan’s market will exacerbate overall health risks,” said the NTU professor. Despite official assurances that ractopamine is safe, a poll conducted by the KMT-friendly TVBS satellite television network of 1,107 Taiwan adults Mar. 12-13 showed that only 31 percent supported the Ma government’s conditional deregulation policy and 59 percent said they did not approve. The Cabinet’s furtive decision also sparked a protest by hundreds of citizens Mar. 8 outside the Cabinet complex in Taipei. The demonstration was organised by the Taiwan Anti-American Beef Alliance (TAABA), a coalition of over 60 food health, consumer protection, environmental and civic organisations. On Mar. 9, thousands of swine farmers protested the KMT government’s deregulation outside the national legislature, and then marched to the Council of Agriculture, where farmers clashed with police and threw eggs at the COA office. On Mar. 12, the mayors of all six DPP-administered municipalities, encompassing 7.2 million of Taiwan’s 23.2 million people, declared their intention to set zero indication standards for ractopamine in their districts. On Mar. 15, TAABA reorganised itself as the National Alliance for Food Safety with more than 100 civic groups as members, at a rally outside the Cabinet complex. Ho Tsung-hsun, executive director of Taiwan’s Life Conservationist Association, told IPS that the new alliance will push for a total ban on ractopamine and will also campaign for full transparency and the institutionalisation of citizen participation in government food safety policy making. Ho observed that the deregulation, which is opposed by the DPP and two other minor parties, could be blocked if only 11 of the 33 KMT lawmakers who previously opposed the move maintained their stands.